Post-axial polydactyly is a common congenital hand anomaly with a wide range of manifestations. 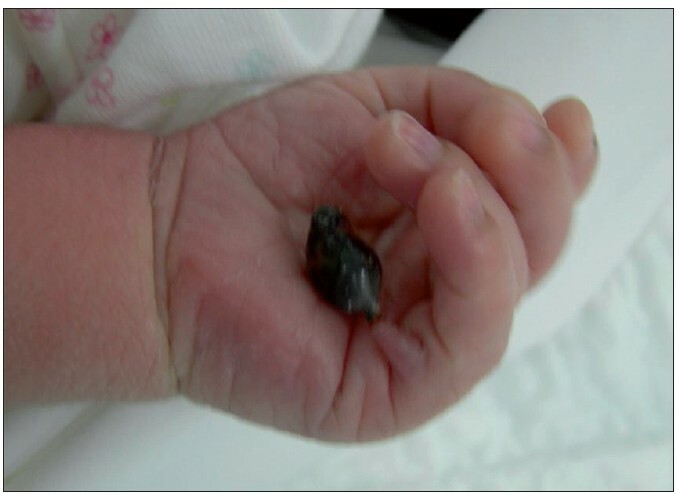 We report here an unusual case of intra-natal torsion of duplicated small finger which presented as gangrene at birth. The duplication of the little finger is one of the most frequent congenital malformations of the hand. The extent of duplication varies from a soft tissue nubbin to a completely developed digit. The presented case probably represents the first reported case of intra-natal torsion of post-axial polydactyly presenting as gangrene at birth, as an extensive review of the literature and Pubmed search did not reveal a similar published case. A male child presented with gangrene of the accessory digit of the left hand at birth [Figure 1]. The child's weight was 6.25 kg and was delivered full term by Caesarean section. There was no similar or other obvious visible anomaly. There was no sibling or family history of any hand/feet or other congenital anomalies. The child was evaluated by a neonatologist and no associated cardiovascular, gastrointestinal or genitourinary system anomaly was found. The ultrasonography of abdomen was normal. The antenatal history was not significant in relation to exposure to viral infection, drugs, alcohol, or radiation in the first trimester. On examination, there was a gangrene of twisted pedunculated accessory digit of left little finger [Figure 2]. The gangrenous digit was excised from the base under local anaesthesia with satisfactory outcome [Figure 3]. The spectrum of the deformity in post-axial polydactyly ranges from a simple soft-tissue problem to a complex completely developed accessory ray. Post-axial polydactyly has been classified into three types based on the degree of duplication. Type I is duplication of soft parts only; Type II is partial duplication of the digit, including the osseous structures; and Type III is complete duplication of the digit, including the metacarpal, but is rare. 1. Woolf CM, Myrianthopoulos NC. Polydactyly in American negroes and whites. Am J Hum Genet 1973;25:397-404. 2. Temtamy SA, McKusick VA. Polydactyly as an isolated malformation. Birth Defect 1978;14:364-92. 3. Temtamy S, Mc Kusick VA. Synopsis of hand malformations with particular emphasis upon genetic factors. Birth Defect 1969;3:125-84. 4. Führer S, May M, Koch A, Marusch F, Gunia S, Erler T, et al. 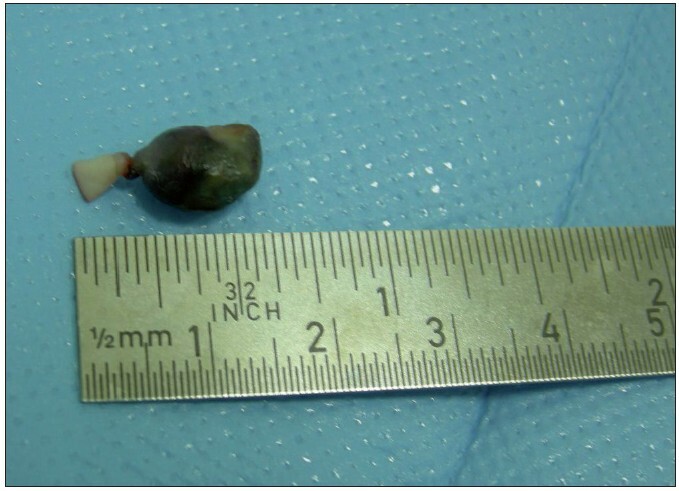 Intrauterine torsion of a testicular teratoma: A case report. J Perinatol 2005;25:220-2. 5. Jobe MT, Wright PE. Cong anomalies of hand. In: Canale TS, editor. Campbell's operative orthopaedics. 9 th ed. St.Louis: Missouri, Mosby; 1998. p. 3791-2. 6. Upton J. Congenital anomalies of the hand and forearm. In: McCarthy JG, editor. Plastic Surgery. 1 st ed. Philadelphia: WB Saunders Company; 1990. p. 5352-6. 7. Flatt AE. Extra fingers. In: The care of congenital hand anomalies. 2 nd ed. St. Louis: Quality Medical Publishing; 1994. p. 292-16. 8. Tachdjian MO. Polydactyly. In: Pediatric orthopedics. 2 nd ed. Philadelphia: W. B. Saunders; 1990. p. 240-57. 9. Kelikian H. Congenital deformities of the hand and forearm. Philadelphia: WB Saunders Company; 1974.